"Is This Home" is only $15.00CAN plus shipping and taxes where applicable! 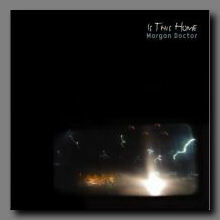 Morgan Doctor "Is This Home"
Downtempo beats from Morgan Doctor. With the release of her disc "Is This Home", Morgan Doctor has put together a stunning collection of songs conceptually linked by the ideas of home and our relations to same. It's an impressive work using acoustic instruments and processed or looped material in a seemless mix that both entrances and inspires. Ideas of what we call home, how we connect with it, and our spiritual connections to it are all addressed in an artistic and creatively satisfying way and, best of all, it's really quite groovy all at the same time. The spoken word introduction "Where You Live" describes home as a physical location or place created by oneself and sets the tone for the disc, a cerebral context for the work to follow. It leads nicely into "Belgium", a violin driven piece that pulses with warmly processed percussion tones and chiming guitar. It's a very rich track, something that surrounds the listener in an enveloping way. "Montreal" is up next, a shimmering song featuring the vocals of Tamara Williamson. It's a very relaxed track, a languid vocal that drifts and flows like a slow moving river. Sounds and instruments move throughout the soundfield completly utilizing the space of the song and creating a truly full environment. "Helms in the Morning" is a more minimal piece, using sparse instrumentation with a series of repeated phrases and loops. It's a very effective track, succeeding in creating a strong mood and sense of location, with the feelings of the space created lasting long after the song's last notes have faded. "Ellikon Marktplatz" incorporates strings, field recordings and snatches of dialogue, all blended in a beautiful way to suggest a stroll through public spaces, with overheard conversations and fleeting discussions on the periphery of the senses. Leah Salomaa provides vocals on "From the Cold", another chill track that uses the idea of warmth as a metaphor for the safety and security of home. It moves along at a very relaxed pace, very serene and calm. "Queen in Parkdale" is a more upbeat track, using processed samples and loops alongside acoustic instruments, resulting in a crunchy and engaging work that suggests the bustle of an urban space. "How I Love You" is a jazzy instrumental with some very tasty bass work and lovely brushed drums. It has a cool and smoky feel to it, something to sway to in a smoky club off the beaten path where only the coolest people know where to go. I defy you not to get caught up in the groove of this one. "Drolma-la" features Tina Park's voicework, repeating phrases over a sparse guitar and percussion backing. It's a very hypnotic track, beguiling in it's steady pulse and tone, wrapping around the listener and drawing them under it's spell. Beautiful. "Albilynn Du Sud" is a lovely track that uses a hand percussion instrument called a hang. It's a very interesting sound, rich in tone and melodicism and Morgan plays it with wonderful skill and precision. Very beautiful. "Centre Island" closes the disc, a hypnotic track where hand drums and repeated phrases loop and swell and build in entrancing ways over the course of it's eighteen minute length. Truly beguiling. Throughout the songs on this disc I can't help but reflect on the many diverse ways in which we look at places, the ways we see them and the ways that we identify with them. It's no small feat to execute a concept so effectively, and there's no doubt in my mind that Morgan Doctor deserves high praise for the work on "Is This Home".